Replace your air track and photogate timers with this unique device that allows students to investigate kinematics and dynamic motion without the need for a photogate. 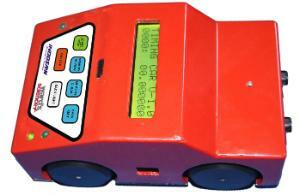 Perform several Laws Of Motion experiments with the timing car that features built-in motion and direction detection with a two-channel sensor, bright LCD display, remote detection sensor, a user replaceable 9V battery and an intelligent micro-controller based circuitry to sense millimeter level movement of the car on linear and non-linear motion. Combine with additional accessories and ramps for added investigation, available separately.